About the expectations for the European Council on 8-9 December, the possible solutions of the crisis and the challenges for the next European budget (MFF 2014-2020) – those were the topics euinside discussed with Ivailo Kalfin, Member of the European Parliament Socialists and Democrats MEP from Bulgaria. It is noteworthy that Mr Kalfin’s position differs from that of his colleagues in the European Parliament. In an attempt to prevent IMF’s intrusion into EU affairs, the MEPs recently called for the creation of a European Monetary Fund, while Mr Kalfin believes that the solution for the crisis lies exactly in co-operation with the IMF and the application of its expertise when helping countries in difficulty. The Bulgarian MEP is one of the two EP representatives in the negotiations with the Council on the next 7-year EU budget. The Parliament is determined that there will be no agreement on the budgetary commitments without a decision on the own resources - an issue that at this stage is highly controversial among the EU Member States. 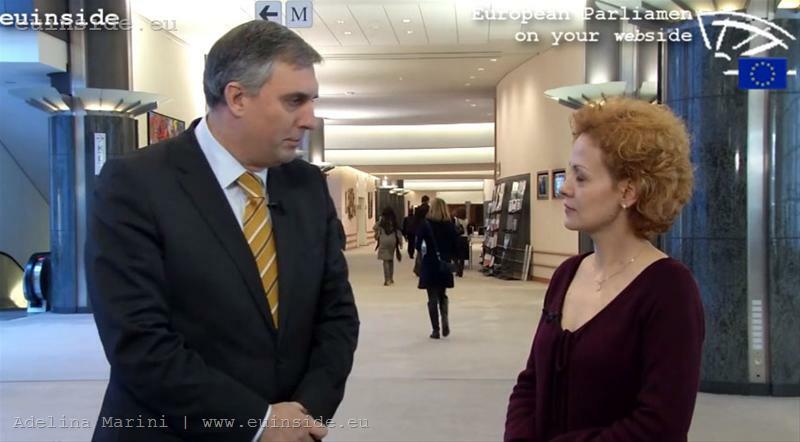 euinside: Hello, we are in the European Parliament’s building in Brussels together with S&D MEP Mr Ivailo Kalfin. Welcome, Mr Kalfin. A very important week begins for the European Union [December 5th]. I would rather not say “decisive” because there are already a lot of expectations. Ivailo Kalfin: Every week is decisive. euinside: Every week is obviously not decisive enough. But before I ask you about your expectations for this week’s events I would like you to comment on the visions, shared recently (and seemingly not in full) by France and Germany in the two much anticipated speeches of Angela Merkel and Nicolas Sarkozy. Ivailo Kalfin: Ms Merkel and Mr Sarkozy will most probably propose [they already have] to the Council [the European Council on 8 – December] some decisions which I'm afraid will not help solving the economic crisis, if that is the point. They will suggest changes in the EU treaty which will allow for more effective mechanisms to take place and be applied by a small group of countries in the framework of the Union. That would mean the creation of an inner circle, possibly around the euro area or even closer. They will suggest more substantial competences for the Commission and sanctions for violations of fiscal policy. There will be some other small amendments. The problem is that each change in the EU treaties means years of political uncertainty, probably the creation of a Convention, and most probably a round of referenda in many member states. This is in no case a solution to the current financial problem of the European Union. euinside: Is there a shortcut to avoid this long procedure of signing in to this fiscal union or pact we are talking about, and to get to the same goal by an intergovernmental agreement between the eurozone countries? Ivailo Kalfin: They can sign whatever they prefer. But in this case they will not be able to use the EU institutions and mechanisms. Therefore, I do not believe that anything will be signed outside the EU framework. The other measures that are under consideration (and the application of which is not clear) refer to a more active approach and are directly meant to deal with the economic crisis. Those are the French President’s proposal for the European Central Bank (ECB) to become more active in buying-out debts, to practically print more euros, thus to help countries. There is a problem, however, with the Lisbon treaty but there is a way the option to become operational under the current treaty. The second issue concerns the Eurobonds – a measure proposed by the Commission president that Germany still resents. The meaning is to make the eurozone countries issue an amount of debt and through it to take up part in the financing of countries in need. A rather useful proposal. I do not know if Germany’s position will rise to it before the summit. euinside: Today is Monday [December 5th] and your working week has just begun, but did you manage to discuss with your colleagues in EP the statement of Nicolas Sarkozy that – too bad for the institutions! – the national leaders are those who should take the decisions and that the integration road of Europe goes through intergovernmental agreements. How are statements like this taken in exactly here, in this institution? Ivailo Kalfin: This is not only Nicolas Sarkozy’s problem. It is also Angela Merkel’s problem and we see now in Europe policies that are being increasingly nationalised. Unfortunately, there is a lack of political courage among the national leaders to put the European problems above the national ones. In France, elections are scheduled for next May; afterwards there will be elections in Germany. Obviously, the leaders of these countries are much more concerned with what their electorates think rather than with what happens in the EU. They seem to be trying to keep their countries outside the commitments toward Europe. That will bring a setback in the European integration with at least a decade. euinside: Finally, to close the topic, do you expect from the Council this Friday – of course, not final decisions – but a signal, strong enough to influence positively the crisis? Ivailo Kalfin: Actual measures against the crisis are definitely expected. Those can be taken in the framework of the Lisbon treaty and there is no need to call upon unclear procedures such as a treaty change. More support should be rendered to the ECB to do its job, the issue about Eurobonds has to find a solution and there is the topic that is very timidly discussed in Europe, but in my opinion should be seriously considered as soon as possible. I mean the involvement of the IMF, which is to do what it knows best to do with countries with problems, so that the troubled eurozone countries could become its clients. euinside: I saw exactly the opposite opinion in the report about ECB's activity in 2010, adopted by Parliament just a couple of days ago. There, it is explicitly said that there should be a European Monetary Fund to prevent IMF's intervention in Europe. It looks as though you stand on a completely different position from that of your fellow MEPs. Ivailo Kalfin: That is correct. My point of view differs and I do not believe that the problems with the financial crisis in Europe can be solved by encapsulation in a close circle of countries. Let me just remind you of the scale of the problem. The Italian debt amounts to around 2 trillion euro. No question at all for a small group of countries in Europe to try to solve the problem – the way is exactly the opposite. Europe has to open and turn to the financial institutions that are able to deal with the problem. You remember that two years ago China bought out a big amount of US debt to support the dollar. In the interconnected world outside Europe there are huge interests to preserve the stability of the euro and Europe should embrace them. What is being done now – a encapsulation in a close circle of countries – this is not a solution to me. The solution is exactly the opposite – opening, involving the IMF. Yes, it will recommend things that are different from the rules in the euro area and for sure some countries will not be happy with IMF bureaucrats giving political instructions. But, the IMF exists exactly with this purpose. We saw it working in Bulgaria and we have survived. euinside: The situation in Bulgaria has definitely improved. Ivailo Kalfin: Yes, the IMF did a good job in Bulgaria. euinside: Well, now, on the contrary of what you are saying, I will bring you back to an internal European issue – the next EU budget. You are Vice-Chairman of the Committee on Budgets and today the Committee is set to discuss the own resources issue. Unfortunately, the topic about the next European framework budget still cannot attract enough attention in Bulgaria. Last week there was a very interesting discussion organised by the Polish Embassy in Sofia and I was impressed by the strong positions of Poland and the UK. I do not mean to surprise you with the news that the UK literally said: “We will vote for more money for Bulgaria and Poland and generally for the new countries under the Cohesion policies, if you support us to abrogate the Common Agricultural Policy (CAP).” No ceremony at all in this statement. The Poles, too, have a very strong and clear position about the increase of the Cohesion Fund, in order to ensure more money for economic growth. While the Bulgarian position … We cannot say that there is no Bulgarian position but it is rather timid. At this stage, where do you see the biggest controversy? euinside: Will there be really serious changes in this regard? Ivailo Kalfin: In some policies there will be major changes and I think that for Bulgaria it is very important to be ready as there are only two years left until 2014. From early 2014, for example, for the Connecting Europe initiative, proposed by the Commission, there will be competition among all Member States. Those with ready projects will be able to apply at the onset. In addition to discussing the amounts that we could get, we should also discuss the policies. And here I see the main value in the debates on the next financial framework. I am one of two MEPs who lead the negotiations with the Council and I must tell you that there will be a lot of problems. The views differ strongly among Member States. euinside: Currently, there are at least two camps on the field. Ivailo Kalfin: Indeed, there are many camps on a variety of issues. What we can clearly say is that now the proposal provides for the cohesion funds to be decreased and the funds for pan-European projects to be increased. For the reduced money for the Cohesion Policy there will probably be a preference for the poorest of the member states, but the Cohesion Policy will here be linked to specific commitments. For the first time we will look for the effect of using EU funds. If until now we used to dispose over some funds and used them for some good projects, from 2014 onwards we will have to demonstrate what we have achieved, in the framework of the European goals, through the use of these funds. Moreover, the agricultural policy, too, and its financing will probably be changed by linking the green payments to the single area payments. A lot of things will happen in terms of new policy approaches and different requirements for readiness. euinside: Bulgaria, and not only Bulgaria - other countries, too - have protested against the ceiling of 2.5% of GNI in the cohesion policy. Can you explain the need for this ceiling? Ivailo Kalfin: This ceiling is needed because cohesion funds are spent not only for the poorest countries. Much of these funds go to rich member states to develop certain areas in their regions, or for research, innovation, etc. As the cohesion policy is open to all EU regions and not only for underdeveloped or new Member States, it is in our interest to have a limit of the funds that go to the rich countries. euinside: Yes, I would have asked the same - whether this was not actually in the interest of the poorer countries? Ivailo Kalfin: I think it is in our interest to have such a ceiling. euinside: I wanted to ask one more thing, again concerning the Bulgarian position: Bulgaria is firmly against the Commission's proposal for a new system of own resources, the financial transaction tax (FTT), a common European VAT. At the same time it wants to have more money for the Cohesion Policy, more money for projects. How the other countries here in Parliament take in this proposal? Ivailo Kalfin: It is being discussed at the moment; this will be one of the most difficult discussions. In principle, Parliament is inclined to discuss the own resources in the budget in the context of the overall negotiations about the framework. This means that there will be no budget without a decision on own resources. The idea is to increase the percentage of these resources, which go directly to the European budget and are not considered as spending in the national budget. Currently this is the case with the duties, but they comprise less than 20% of the total budget. The Commission proposes part of the VAT to go to the EU budget in exchange for reduced national payments and, in addition, to introduce a new tax on financial transactions. Both proposals are in Bulgaria's interest. I honestly cannot explain and I cannot understand Bulgaria’s position against those two elements. It is in our interest to have a strong and properly funded European budget because we are a net-recipient country. The donor-countries in this budget are trying to limit in any way the funds they pay. So it is in Bulgaria’s interest the EU budget to be financed in a bigger grade by own revenues, rather than by payments from national budgets. I still hope there will be a serious discussion in Bulgaria on those issues. Once we have analysed these problems, we should not be against it. The proposals do not mean more taxes for Bulgaria. euinside: We also hope for more serious discussions. euinside will certainly organise a discussion on this topic in the coming months. Thank you, Mr Kalfin!